Happy Tuesday Everyone! Can you boil an egg? It's really one of the most basic cooking techniques out there, right after learning to boil water. But sometimes this simple task can cause frustration to the best of us. It's not just boiling an egg, it's also getting that egg peeled that is part of the problem. My husband threw out a half dozen eggs once because they were impossible to peel and they just fell apart on him. Frustration led to the waste of some perfectly good eggs. So I have been listening to every one out there and their theories of how to boil the perfect egg. I finally decided on this method with the tips I learned from a few places. The first part of boiling the egg comes from Rachael Ray. The 2nd part about peeling them easily comes from various places where I heard getting the eggs cracked and into ice cold water to shock them helps get those peels off. 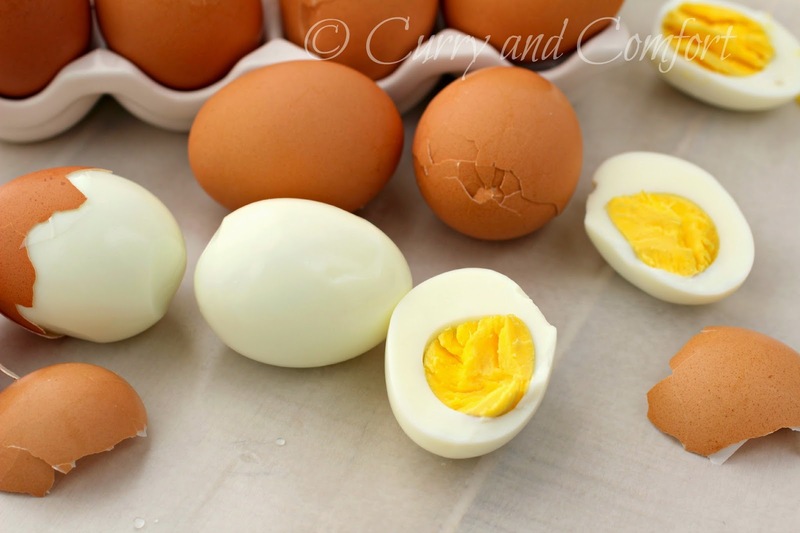 I have used this method for a few years now and I get nice yellow (no green/gray) yolks and easy peel-able eggs every time. Note: It does not matter what color of egg you use. I used brown here in the demo because it's easier to see the peel against the white of the egg for photography purposes. 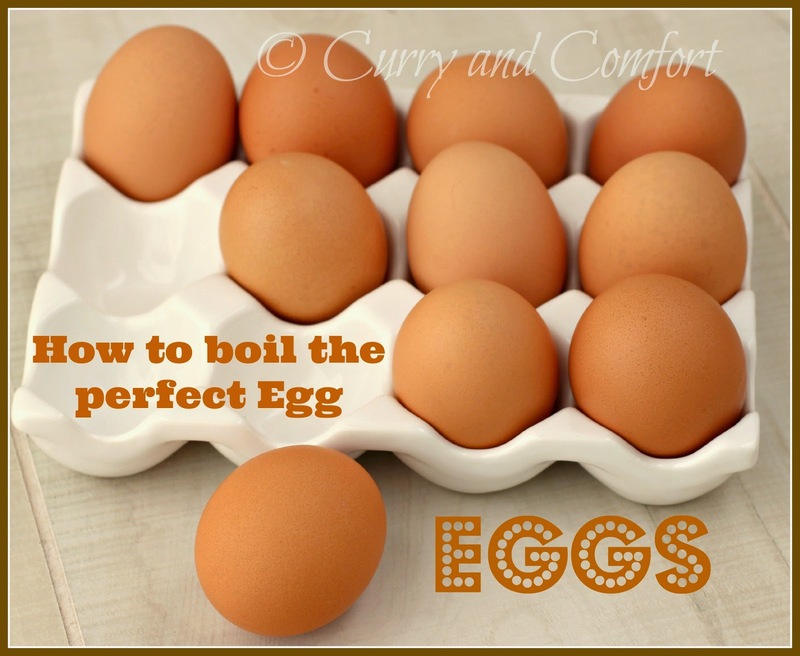 Step 1: Place raw large eggs in a pot with cold water about 1 inch above eggs. 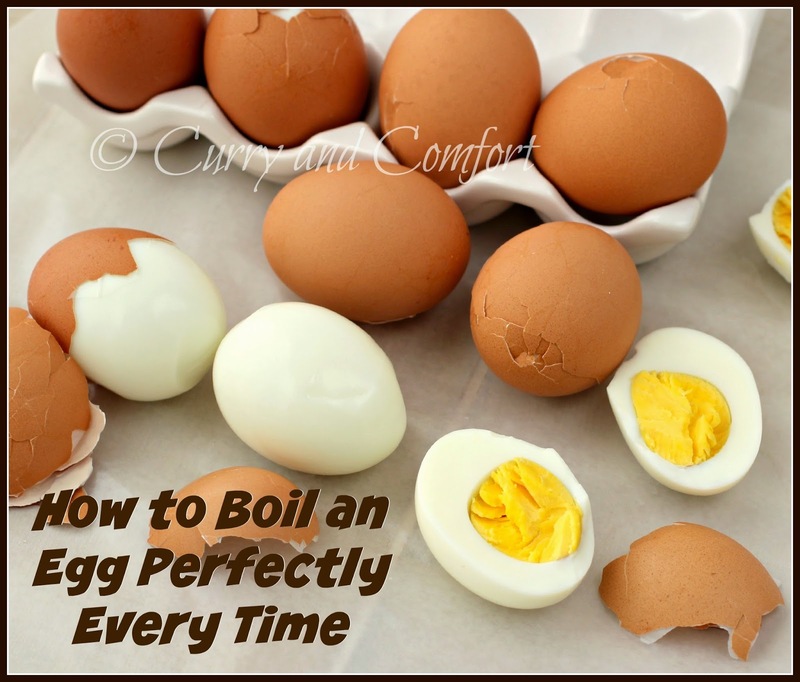 Step2: Place eggs on stove on high heat and bring water to a boil for 1 minute. Step 3: Turn stove off and place lid on pot and set timer for 10 minutes. Step 4: Drain hot water out of pot and rinse with cold water. Step 5: Tap each egg to gently crack them and place into a bowl or pan with ice cold water (you can put some ice into the water to achieve this temperature). Let them sit in the ice bath for 3-4 minutes. Step 6: Peel eggs and Enjoy. Extra Tips I have read: Use older eggs (more than a 10 days old) rather than fresh eggs to help with getting the peel off better. I agree with Nami; your eggs are perfect. I hadn't heard the tip about cracking the cooked eggs and leaving them in cold water for a few minutes, but it makes sense. I'll have to give that a try. Thanks for the awesome tutorial, my friend. Hard boiled eggs are the best! You definitely need to know how to do it though. Once you have it down it is so easy! I follow similar rules, just that I let it boil for 5 minutes, then let it sit in the water, take out, crack and let cool through running water. I am going to try your tip next with the ice water, thanks for sharing! One of the best tips I've read in a long time, thank you! I haven't boiled mine in over a year, I steam them, a t.v. chef last year told how to do this...I usually do a dozen or so at a time, I steam them for exactly 19 minutes, dump them from the steamer into a sink of cold water, crack and peel them immediately, beginning at the fat end of the egg because that's where the air pocket is and you're able to grasp the egg membrane easily & the shells come off slick as a whistle. I tell you immediately because one time only did I allow them to sit after I had cracked them & left them in cold water... it was like they'd been boiled. I've never made that mistake again...I've never gotten the green around the yolk, but I am going to follow your tutorial because it always helps to learn something new... I love your blog Ramona, you have the best recipes. Have a blessed day everyone!